We are very excited to introduce another Step2 product to you. We got to review the Tropical Island Resort water table. Can you imagine how excited my little ones were when they saw this big box sitting on our front porch? We immediately took it out back on our patio and began to open the box. We laid out all of the pieces and began to look at the directions. The only thing we recommend is having a screw gun charged. There are not that many screws but using it makes it go twice as fast. Hours of splish and splash water fun! Made in USA of US and imported parts. Some accessories made in China. Here are a few pics of my little ones enjoying their new water table! My kids absolutely love this table. The recommended age is 1.5 and up. My kids are ages 8, 6 and 1 and as you can see they are all enjoying playing with it. We live in Florida and we have had some beautiful, warm weather so they have been able to play with it alot. They tell me all the time how much they love it and beg me to let them play with it. I love that it is a bigger design so all 3 of them can easily fit around it. I also like that they have several different pieces throughout the table. There is something for everyone to play with so they are not fussing over the same piece. I also like that you can take some of the items off if you don't want them on there and place them back on. My baby girl is constantly taking them off and putting them somewhere else. My older two children just laugh. It doesn't take long to fill up with water and is just as easy to drain. There is a black plug on the inside of the table. All you have to do is pull it up and the water drains out. The plug is very secure and ensure that their is no dripping. This is a huge plus on my end. We had a water table in the past from another company and it constantly leaked and drove me nuts. We also took a video and we invite you to view it as well. I invite you to stop by and view all of Step2 wonderful products. Follow Step2 on Facebook and Twitter too. 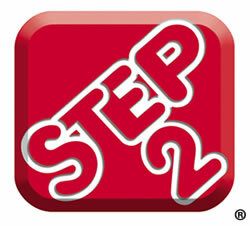 Be sure to Follow the Step2 Blog to stay up to date on specials etc.